Brewing shiitake mushroom beer. Shiitake mushrooms give stout and Portello a fresh, earthy flavor which is becoming popular across the world. The shiitake originates from South-East Asian countries like Japan, Korea, and China. Shiitake mushrooms grow on the wood of old rotting hardwood trees like the Asian beech and oak trees. The cap ranges from an amber color to dark brown, which fades as it matures. It grows up to 20 cm across and the umbrella shaped cap curls into a rim. The gills are white and bruise easily when damaged. They grow up to 20 cm high. The have a garlicky pine tree bouquet that imparts a rich earthy flavor to boutique beers. 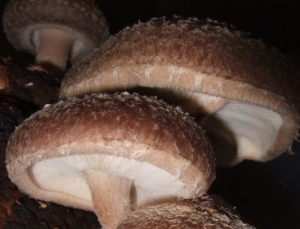 You can buy shiitake mushroom farms to grow your own mushrooms at home. These can yield mushrooms for up to 3 months. You can also use old rotting logs like willow, cottonwood, beech, sweetgum eucalyptus, birch, and ironwood for growing shiitake mushrooms.